We arrive in Marrakesh by train from Fes and get a Grand taxi – a sandy coloured, late '70s Mercedes – to the medina. The driver drops us off in the dark and a wiry man with a wooden cart springs into action and negotiates to take our luggage and lead us to our riad, courtyard guest house, inside the walled city. In a dimly lit alley, we knock on the door of Riad Sara. We are greeted with a smile and a heady waft of orange oil. We are led into a beautifully lit courtyard with orange trees and an artfully designed interior to check in over mint tea. After a deep sleep we are ready to explore the city through its contemporary art scene. Marrakesh is an exotic location for an art event. More than a backdrop, it has long been attracting the culturati from the 1960s with bohemian jetsetters like John Paul Getty jnr and his wife Talitha, the Rolling Stones and fashion designer Yves Saint Laurent. There are iconic images of them here photographed by society snapper pals, Cecil Beaton or Patrick Lichfield. The hippies followed, all drawn to the culture, art, music, mysticism and drugs seeking "otherness" in post-French colonial Morocco. Now Marrakesh is drawing a different generation of artists and culture travellers to the UNESCO-listed medina. "Cultural entrepreneur" Vanessa Branson (sister of Richard) is the president and founder, in 2004, of the not-for-profit Marrakesh Biennale. This 6th Biennale, from late February to May, showcases contemporary Sub-Sahara African, Arab and Mediterranean art and is rated in the top 20 biennale events in the world. Fuelling this is a thriving contemporary art scene, with numerous galleries in the Ville Nouvelle outside the medina. While planning my trip, I come across Australian artist, curator and now art tour operator, Rita Lazauskas and partner Bruce Derrick. Based in Marrakesh, they are part of this generational shift. 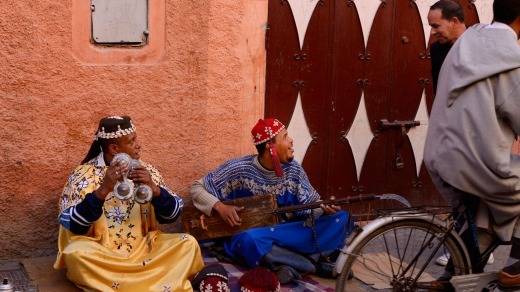 They started Amazigh Cultural Tours Morocco five years ago, inviting Australian artists to lead tours and workshops in Marrakesh, with field trips to the Atlas Mountains and the desert. Business partner and guide Abdou Imelouane is a Berber. The indigenous Amazigh (Berber) culture has existed alongside Arab Islamic settlement since the 7th century. The biennale will deliver its program in historical, public spaces. 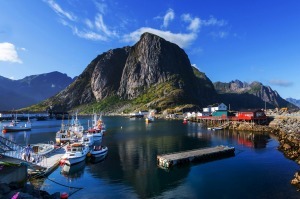 For travellers, this is a real bonus, a double dose of art and culture, blending modernity and tradition. Rita will lead an additional ACTM biennale tour. As well, acclaimed art photographer Anne Zahalka will run her second ACTM tour at the end of February to coincide with the biennale. Abdou organises a licensed city tour guide to take us to historic sites in the medina that will house exhibitions, talks, installations and events over the 11-week biennale program and form part of Rita's tour. We will do our own gallery crawl. 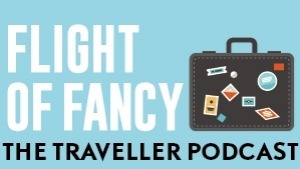 Our itinerary is turning from a taster into a smorgasbord. Our city guide, Mohammad, walks with purpose through the maze of the medina to the beautifully restored Dar Bellarj. Curiously, it was a hospital for storks, revered birds in Morocco. Now it protects and promotes Moroccan culture. There is an extensive photographic exhibition with portraits of the performers and musicians of the Djemaa El-Fnaa, the ancient square in the medina. It includes acrobats, fortune-tellers, water-sellers, magicians and snake charmers. A life-sized hologram of a storyteller in full flight captivates local visitors. In 2001, the square was designated a "Masterpiece of the Oral and Intangible Heritage of Humanity" by UNESCO. The Maison de la Photographie of Marrakesh has an extraordinary collection of photographs from the 1870s to the 1960s. There are haunting studio portraits and images of daily scenes from Jewish, Arab and Berber communities taken by famous and anonymous photographers. A 1957 documentary is worth watching. On the rooftop is a panoramic view of the medina, dotted with satellite dishes. Both photographic exhibitions are more than a social record, providing a context that is transporting and contemplative. The El Badi Palace is an expansive ruin, popular with nesting storks, as well as tourists. Concerts and festivals are staged in the grounds. We are surprised by the Marrakesh Museum for Photography and Visual Arts at the far end, exhibiting Japanese photographer, Daido Moriyama. The elaborate Bahia Palace, constructed in the 1860s by the Grand Vizier Si Moussa, was taken over by former slave and then vizier, Abu "Bou" Ahmeed. In the early 1900s, a warlord took over and entertained French guests, who also took a liking to this incredible place. Three years later, the French ousted him and installed the protectorate's resident-generaux. The palace is unfurnished, but it allows you to focus on the exquisite tiling, details on walls, floors, courtyards and ceilings. Nearby Maison Tiskiwin is filled with indigenous artefacts, where each room represents a caravan stop from the Sahara to Marrakesh. We have dinner at the cool and classy Nomad restaurant near the spice market. The young chefs have reinterpreted classic Moroccan dishes. The calamari with harissa and baked fennel is spectacular. Profits from the daily special go to charity. The rooftop terrace table looks over what was once a slave market. I remind myself the city is around 1000 years old. Being in the present at this point is much more enjoyable. Next day, we venture out of the medina to the striking Jardin Majorelle. In 1966, Yves Saint Laurent and his partner Pierre Berge first saw the garden and the brilliant cobalt blue, Cubist-inspired villa. They bought it in 1980, saving it from demolition. 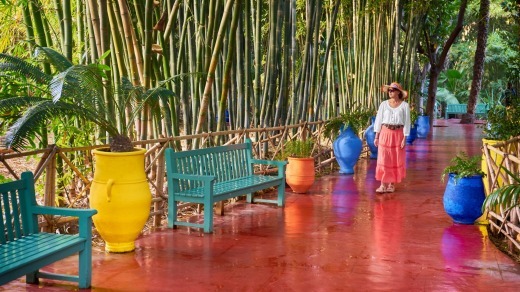 The original owner, artist Jacques Majorelle, began the gardens in 1924. 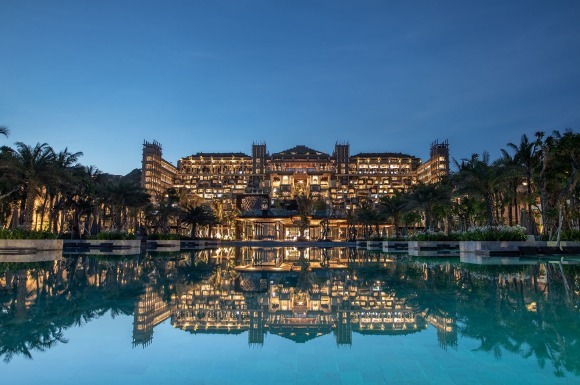 Now his vision has been realised with a surreal manicured desert landscape of giant cacti and lush gardens around a network of waterways and ponds. Yves Saint Laurent turned Marjorelle's studio into a Berber museum housing a stunning collection. The black ceiling with small lights evokes a night sky strewn with stars in the Atlas Mountains, and is slightly disorientating. After lunch at the garden's cafe, we begin our gallery crawl. The elegant David Bloch gallery would not look out of place in Sydney or New York. There is a joint exhibition by New York-based sculptor and painter, Carlos Mareand French artist Vincent Abadie Hafez, The Intersection of Memories. Their work integrates Islamic art, writing and graffiti. They also work with artisans in the medina. I resist the urge to buy one of Carlos Mare's smaller works. The Matisse Gallery includes the work of artist Hassan Hajjaj, the so-called Andy Warhol of Morocco. He designed a bar in Paris in 2003 named "Andy Wahloo", Parisian slang for, "I have nothing". He draws from London's hip-hop, reggae and fashion scenes, integrating his Moroccan heritage. It is irreverent and colourful, co-opting the familiar with soft drink can borders, Louis Vuitton motifs on babouche slippers and women in camouflage print outfits. Hajjaj will be designing the entrance to an abandoned Art Deco building for the Biennale Cafe. I bet my bottom dirham, he won't be using a desert palette. ​Galerie Noir Sur Blanc, on the first floor of a nondescript building, has a great little show with smaller works by local and French artists. Our final stop is Gallery 127, founded by Nathalie Locatelli. She exhibits local and international photographers in this beautiful space. Our afternoon in this precinct is energising and we get a sense of how the biennale will work in this historical city. We hail a petit taxi back to the medina before bewitching hour at the Djemaa El- Fnaa. Public executions provided the original drama; now incredible street theatre brings this place alive. We view the gathering throng from the verandah of Cafe France. As the sun goes down to the call to prayer, the snake charmers and monkeys on leads with their handlers change shifts with musicians and other performers as food stalls are set up around the orange juice stands. As darkness falls, Gnawa musicians strike up trance-inducing rhythms. A young boy dances energetically. His traditional cap is encrusted with a band of cowrie shells and a long tassel, which spins as he dances. A halqa, or crowd, has formed around this mesmerising performance. Robert Plant and Jimmy Page collaborated with Gnawa musicians in the early '90s, and the Led Zeppelin duo performed in the square. You don't have to scratch too hard to find a Western artist influenced by Moroccan culture in some way. ACTM tour leaders include artists Wendy Sharpe, Anne Zahalka, Martin King, Susan Purdy and Dore Stockhausen, who conduct, painting, photography, drawing, printmaking, jewellery and textiles workshops where you can immerse yourself in creative activities with like-minded souls. This year ACTM will have a studio for local artists and artisans and an Australian artists residential program. Who knows what may come out of this collaboration in time for the next biennale? It's 35 minutes by fast ferry from Tarifa, Spain, to Tangiers, then take a train to Fes; it takes seven hours from Fes to Marrakesh. 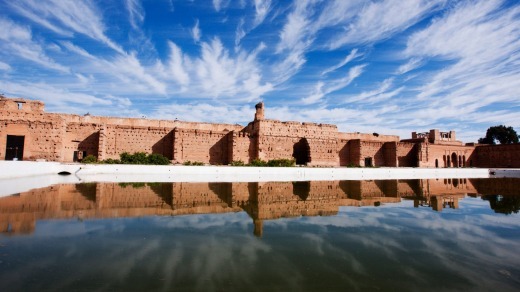 Alternately, fly from Madrid to Marrakesh with Iberian, Ryanair or Easyjet. Organise a registered city guide through your riad to see the sights in the medina to avoid getting lost and maximise your time. There are plenty of opportunities to get lost later shopping in the souks. 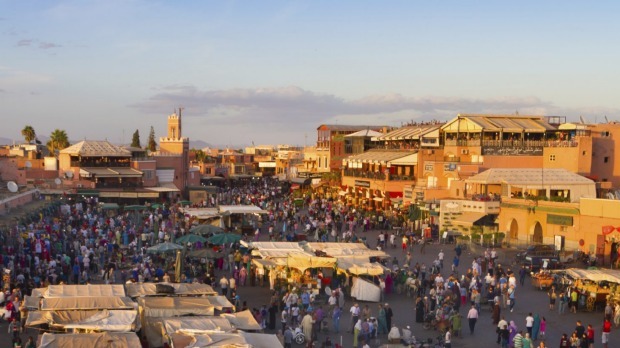 Marrakesh is a tolerant place and used to travellers, but women on their own can attract more attention. No need to wear a headscarf, but respect the local culture and dress modestly. Riad Sara has beautiful courtyards and 12 rooms; great atmosphere, service and value, with a standard double from $85; see dar-sara-srira.com. Riad Helen has five rooms, great service and good value, with standard double rooms from $98; see riadhelen.com. Riad Jardin Secret is a stunning renovation and restoration with standard doubles from $229; see www.riadjardinsecret.com./home. Lesley Holden travelled at her own expense.